From left, Strang, Jeff Brewster and Edgar Rose at the APBA annual conference last January. Charlie Strang was a marine-propulsion icon. To those who knew and worked with him, he was brilliant. A genius. He was just one month shy of 97 years old when he passed away peacefully on March 11, 2018, and he was remarkably keen-minded until his final hours. His wife, Barbara, said Strang walked and picked up the mail every day, including on March 11, when he went into the kitchen, had some tea, made and ate his lunch, and then washed his dishes. He felt tired, so she suggested that he “go sit in your chair and relax.” So, he did. After 30 minutes or so, she found him with the sun shining on his face. She shook his arm to get him to change his position. No response. Strang had peacefully passed away. Charlie Strang will also be remembered for many achievements and awards. He created the concept of the sterndrive while at MIT. He had about 3 dozen patents. 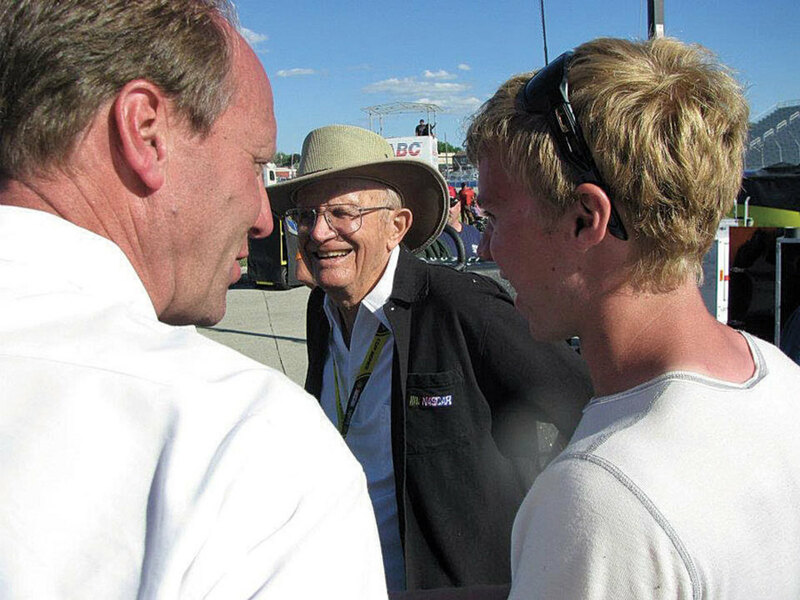 In 1998, eight years after his retirement, Bill France, one of the two owners of NASCAR, announced that Strang would be the National Commissioner for NASCAR, a position he held for 10 years. 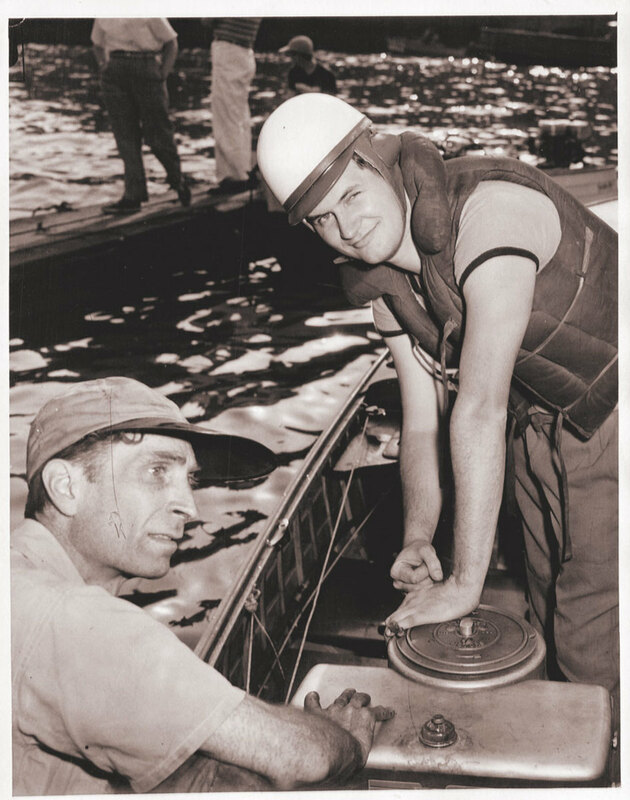 At 95, Strang was still in the boating game as National Commissioner of the APBA (American Power Boat Association). Elected to the National Marine Manufacturers Association Hall of Fame. 2011 elected to the UIM Hall of Fame. 2015 inducted into the MOPAR Hall of Fame. He retired from Outboard Marine Corp. in 1990, when he turned 70. He retired then because of what many OMC veterans considered a foolish corporate policy that required board members to retire at age 70. What a shame (Strang admitted that he had been part of the board’s bad decision to set that age limit). OMC had been profitable under his tenure as president and, later, chairman of the board and CEO. The license plate on his car read ROI 15. If the OMC board had just changed that mandatory retirement rule, Strang could have stayed on for many more years and kept OMC profitable — probably still going strong today. Until he passed away, he was so incredibly sharp. When I called him in 2013 for an article interview, he was 92. When he answered the phone, he sounded 30 or 40. I wasn’t sure who it was, so I said, “Is Charlie there?” He said, “This is Charlie.” I was surprised he sounded so young and sharp. I asked him how his health was and he said, “It is excellent.” Then I asked how he sounded so young and energetic. Strang (helmet) before the start of a 100-mile race down the Hudson River. Earl Bentz was also a close friend of Strang’s, having worked for him for several years as president of OMC’s fishing boat companies. Edgar Rose knew was another Strang fan and he knew Charlie longer than any of us, having served as vice president of engineering at OMC. They met in December 1947 when Rose was writing his master’s thesis at the Massachusetts Institute of Technology. His thesis subject was lubrication so he went to the MIT lube lab. Rose met Strang, who already had his degree and was working there. Strang helped Rose finish his thesis in time to get his degree and they became good friends, going on to work together for Carl Kiekhaefer at Mercury. 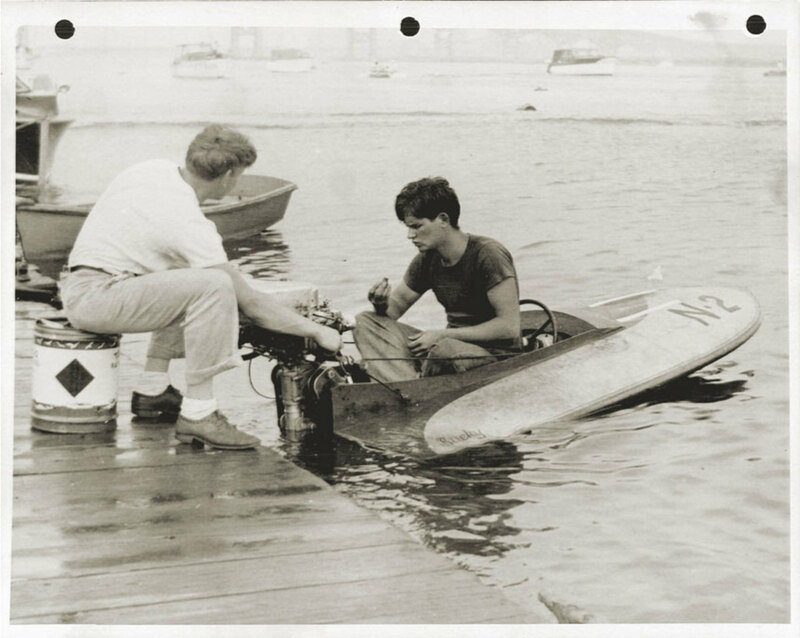 Early in his competition days, a teenage Strang (in boat) prepares for a race. In 1950, at the American Power Boat Association National Championships near Winter Haven, Fla., Strang had a brief first meeting with Kiekhaefer, who accused the race judges of making an unfair call on one of Kiekhaefer’s drivers. Kiekhaefer heard how Strang handled the situation and thanked him for his support. The two later met again at the APBA annual meeting. Strang asked Kiekhaefer why Mercury didn’t build a bigger-horsepower outboard. Kiekhaefer responded, with, “If you are so damned smart, why don’t you come and build it for us?” In June 1951, Strang went to work for Kiekhaefer as director of research at the in Oshkosh, Wis. Shortly after that, Strang convinced Rose to come to Oshkosh and work for him. Strang eventually became executive vice president of Mercury, second only to Kiekhaefer in the company. A few years ago, I asked Strang why he left Mercury. He said, “In 1961, Carl Kiekhaefer sold his company to Brunswick but continued to manage the business. At that point Carl just couldn’t accept the reality that he had sold Mercury and it was no longer his.” That led to continuous conflicts between Carl and Brunswick that continued to escalate. It is a long story but it ended with Charlie resigning in 1964. After leaving Mercury, Strang did consulting work. 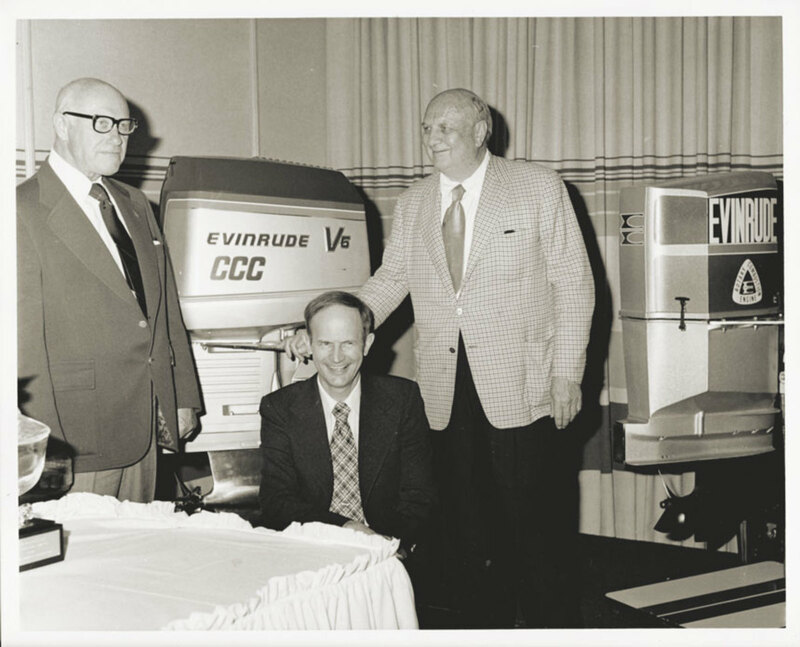 Ralph Evinrude had him do some projects for Doc Jones, an Evinrude distributor in Colorado and Arizona. Jones had Strang designing high-speed gearcases for OMC outboards. Strang later learned that the deal he had was set up by Evinrude. He wanted to hire Strang but wanted to make sure he had no loyalties to Kiekhaefer. So, Strang ended up working for OMC. Evinrude made him head of marine engineering. About a year afterward, Strang brought Rose on board in the engineering department in 1967. Strang became OMC’s president and general manager in 1974; president and CEO in 1980; and chairman of the board in 1982. Rose became vice president of engineering, a position he held until he retired in 1991 at age 65. “Charlie was a damned good engineer and always extremely fair to work for,” Rose said. “He was a very logical person, which always appealed to me. And Charlie was never driven by corporate politics. He was just interested in getting results.” Edgar and Charlie remained good friends. Craig Cermak, who married Charlie and Barbara’s niece, said Charlie always thought outside the norm. Left, Strang (seated), Carl Kiekhaefer (glasses) and Ralph Evinrude at a press luncheon. But to those of us who knew Charlie Strang, he will simply — and greatly — be missed.